With all these Christmas in July challenges I have really gotten into making some holiday cards. I followed the sketch from Mojo Monday on this card. I also put the snowman on an action wobble, I just love it! I also think the Peachy Keen Face just brings it all together. We are getting closer to our "200 Follower Giveaway" someone is going to get a $100. Michaels giftcard. What a wonderful card!! !Love the Snowman! !So Cute! Oh i just LOVE this card! That snowman has the cutest face!!! Such beautiful colors and love the banners! Thanks for joining us at Die Cuttin' Divas this week. I love your card, The snowman is adorable. TFS. This is so incredibly cute. Love the snowman and the DP. Thanks for joining us at the Clear It Out Challenge blog. What a cute card! Thanks for joining us at DCD this week! I love this adorable card and thanks so much for entering at Exploring Cricut. I am a new follower too! This is adorable! Thanks for sharing at Die Cuttin Divas! Thanks for inviting me over! Now I am a follower of you too! Love this card and your blog is spectacular!!! darling! Thanks for playing along at MEFY! Oh! What a sweet snowman, and I love his wooly scarf!! Thanks so much for playing at the Go Fish Challenge! What a superb snowman. Thanks for sharing at Die Cuttin' Diva this week. Love that cute snowman! Thank you for playing with us at Exploring Cricut! Beautiful card!!! 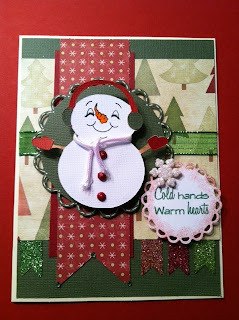 Love your design and that adorable snowman!! Thank you so much for joining us at the Go Fish! Challenge!